Why Not? Add a Spoonful . . .
of Harissa to my plain bowl of brothy beans for lunch? 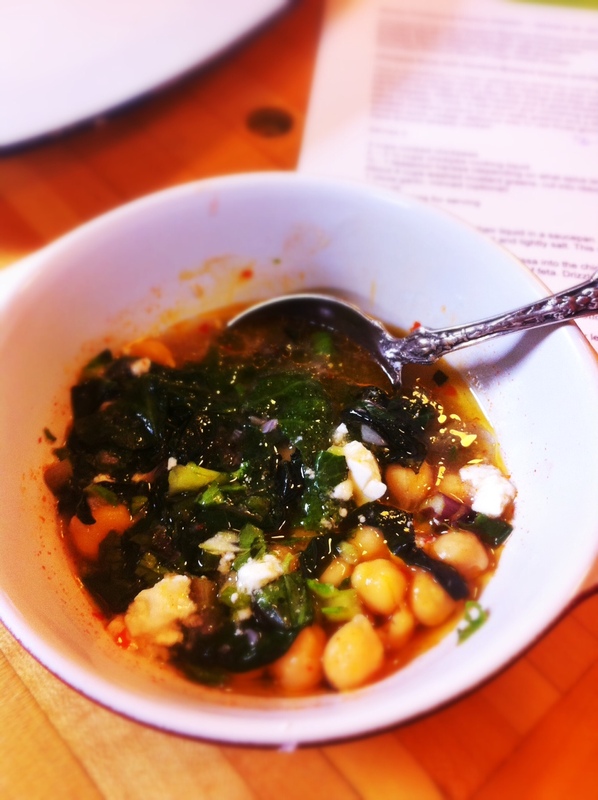 Why not do the same a few days later with chickpeas and top them with garlicky sautéed mustard greens and feta? This was such a success that I taught it in a recent class and I’ve noted the recipe below. I use this wonderful smoky, spicy paste in this greens and bulgur dish and have been reaching for it this winter to enliven eggs, bowls of rice and now beans. There are lots of recipes online to make your own Harissa and my favorite store-bought brand is Mustapha’s. Why not? has become my new teaching refrain as well. It of course goes hand in hand with the cook-with-what-you-have approach of substituting and adapting on the fly and is a catchy enough reminder to not be bound word for word to recipes and thus make cooking more fun, less stressful and more satisfying. A spice paste often from Morocco of chilies, garlic, lemon and oil. I’ve had a couple of successes with the why not? approach lately. I added lots of sliced, raw leeks instead of a little onion to a gratin of root vegetables. Not sure why I’d never done that but it gave the gratin a lush, silky sweetness. I filled burritos with pinto beans and sautéed chard and roasted tomatoes. I made the Cauliflower Pasta Risotto that I wrote about here with Brussels Sprouts and bacon. And last night I thinned down heavy whipping cream with milk since the cream was so thick I thought it might not whip into a nice light topping for my son’s birthday chocolate pie. It worked beautifully! Sometimes the why not? approach is less successful as in the time I added some homemade vanilla extract (vodka plus vanilla beans) from a very fresh batch of extract to heavy cream that I whipped for some dessert and the cream tasted sour from the vodka that had not yet really been infused by the vanilla beans. Have you had moments like these? Successful or less so? I’d love to hear about them. This is something I’ve been eating this winter for lunch with a variety of toppings or additions. 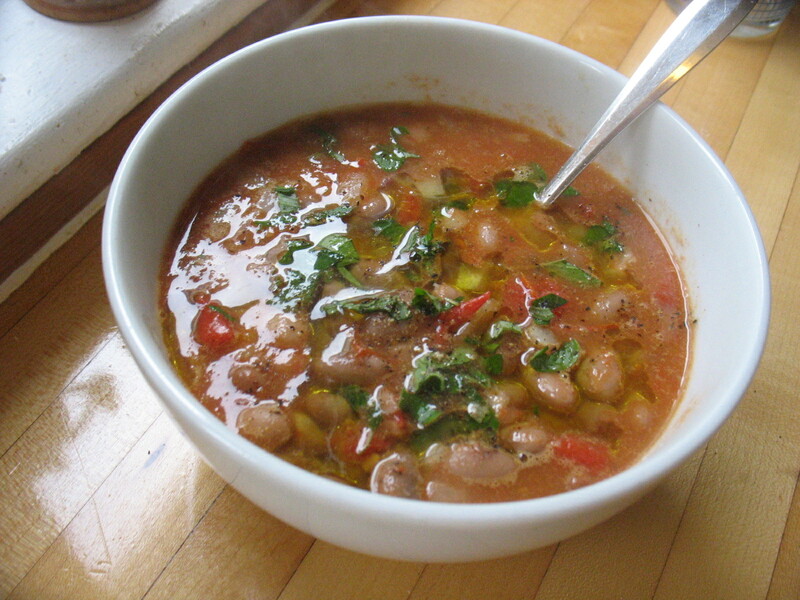 It came about one day when all I had ready to eat was cooked chickpeas in their broth, a jar of Harissa in the fridge (and a few other things but they were not suitable for lunch). I heated up the chickpeas, added a little Harissa and a good drizzle of olive oil and lunch was had, with a piece of bread, I think. It was warm and nourishing and lovely. I like the addition of quickly sautéed mustard greens (or any leafy greens) and a little feta. This is just a basic template and another quick, cheap, delicious way to use those glorious chickpeas or any kind of bean you have around already cooked. Heat the chickpeas and their liquid in a saucepan. Sauté the mustard greens with the garlic in a bit of olive oil until just wilted and lightly salt. This should only take about 3-5 minutes. When ready to serve, stir the Harissa into the chickpeas and portion the soup into bowls. Top with the mustard greens and a bit of feta. Drizzle on a little more good olive oil and grind of pepper and enjoy! Yum! My ‘what do I have for dinner?’ conundrum is resolved. I can’t wait! Excellent. Hope it turns out to your liking. 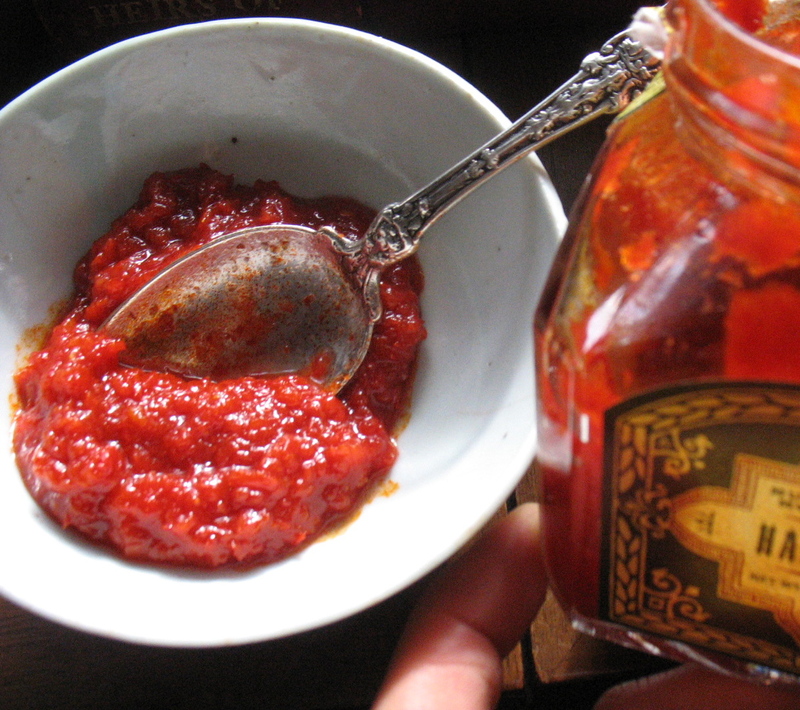 Katherine… can you suggest options for purchasing harissa locally in Portland and which brands you prefer? Mustapha’s is my favorite brand–pictured above–and New Seasons, Whole Foods and Market of Choice typically have it. Pastaworks carries a different brand that I like as well and is a bit darker in color but I forget the brand.